Extremely durable Whitecote polyester-coated steel blade. Versatile internal ground spike is of stainless steel construction and slots into the base for a sturdy ground mounting or upright so the tape end-loop can be used to measure and set out arcs and circles. When not in use the ground spike stores in the upper handle. Rubber grip handle for firm control and comfort, plus space to use with gloves. Robust construction plus rubber buffer protection. Press-button lock grips the blade firmly, making it simple to pull the blade taught while maintaining firm and easy control of the hand grip. Easy and accessible 'unlock' switch. An optimum winding radius and ratioed blade drum diameter result in a low effort, high efficiency rewind and with ergonomic shaped handles. Unique right and left rewind handles for full control for right or left hand use. Handles flip closed into recesses for protection and streamlined storage when not in use. Specially angled advanced blade feed for smooth forwards or backwards spooling out and rewinding, plus end-hook "tuck" storage. Side apertures for clean flushing of blade after on-site use. Triple-action end-hook: 1) loop for use with an integral spike or pole; 2) groove for use with a nail; 3) claw for clip-down attachment. Advanced ergonomics means the user has comfortable control, whether measuring at ground or raised level: the foot guides the frame to an appropriate angle at ground level and at raised level the frame can be used with a one or two hand grip. 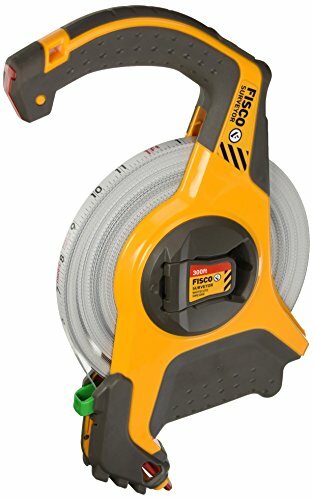 With the blade rewound, the Fisco Surveyor tape can be carried comfortably by either the top handle (with ample clearance for use with gloves) or by the base grip. Blade is marked and numbered in feet and inches (1/8ths) on top side, bottom side is marked in 100ths and marked and numbered in 10ths and feet.